The first four Stormy Day books were produced by Tantor Publishing, so when we switched over to publishing the books directly, due to contracts and blah-blah business stuff, the search was on for a new narrator and producer who could take over the series in audio. It was actually quite easy to pick CHERYL MAY as the new voice of the series--easy, once we heard her charming interpretation of the characters! We apologize to readers for having to change the voice mid-series, but we hope you will enjoy the story as told by narrator Cheryl May, who has done an amazing job bringing the story to life. 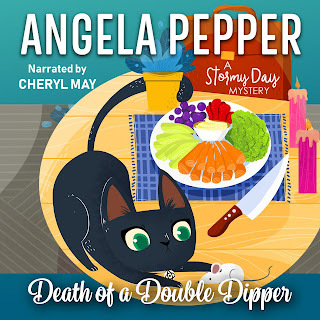 Stormy Day book 5, Death of a Double Dipper, is now available in audiobook. You can find it on Audible, Amazon, and iTunes. Here's a link to the Audible edition. ANGELA PEPPER PUBLISHING. Simple theme. Powered by Blogger.